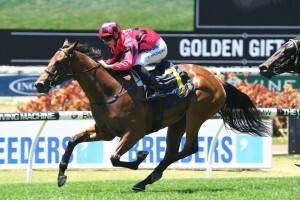 Last year’s Golden Slipper winning trainer Gary Portelli is confident that his filly Secret Lady has enough early speed to overcome a wide barrier in the Group 3 $150,000 Widden Stakes (1100m) at Rosehill on Saturday. Secret Lady, above, has drawn a wide barrier in the 2018 Widden Stakes at Rosehill. Photo by Steve Hart. Portelli saddled up She Will Reign to win the 2017 Group 1 $3.5m Longines Golden Slipper (1200m) at Rosehill almost twelve months ago and while Secret Lady hasn’t reached that level, the top Warwick Farm trainer knows she has plenty of ability. Jason Collet takes the mount on Secret Lady who has drawn barrier twelve in the thirteen horse Widden Stakes field for the two year old fillies. “She is very fast out of the gates and I can see her crossing most of these,’’ Portelli told The Daily Telegraph. Portelli would love to win a second Golden Slipper but will first aim Secret Lady towards the Group 1 $1.5m Ladbrokes Blue Diamond Stakes (1200m) at Caulfield on February 24. “We still have her in the Blue Diamond but I want to see how she goes on Saturday,’’ Portelli said. Early betting at Ladbrokes.com.au for the Ladbrokes Blue Diamond Stakes has Secret Lady marked at $51 while in the Golden Slipper the Choisir filly is rated a $67 chance. Secret Lady has been to the races four times for one win, two seconds and a last start fifth to the Golden Slipper favourite Sunlight in the $2m Magic Millions 2yo Classic (1200m) at the Gold Coast on January 13. The speedy filly debuted for a second over 1100m in a two year old Handicap at Rosehill on November 11 and then went on to win second up in the $150,000 Golden Gift (1100m) at Rosehill on November 25. Portelli then gave the filly a short freshen up before resuming for a second in an 1100m two year old Plate at Randwick before heading to the Gold Coast. Secret Lady is on the second line of betting at $6 for the Widden Stakes behind the Chris Waller trained filly Fiesta who sits at the top of the market order at $3.20. The Gai Waterhouse and Adrian Bott trained Bold Arial, with the blinkers on for the first time, is on the third line of betting at $6.50 ahead of Into The Abyss at $8.50.